Once more, downloaded audiobooks are the format leader, up 32.1 percent in the first quarter of 2018, according to the Association of American Publishers’ StatShot report. On the approach to BookExpo, which opens Wednesday (May 30) in New York City, the Association of American Publishers has released an upbeat StatShot report showing a 6.2-percent bump in the first quarter of 2018, year over year. 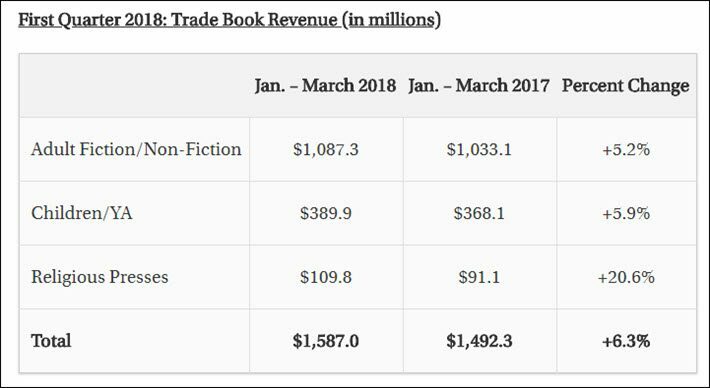 Trade titles, the report tells us, increased by $94.7 million (up 6.3 percent) to $1.59 billion in the first quarter—with growth in adult books, children and YA, as well as religious presses reporting. 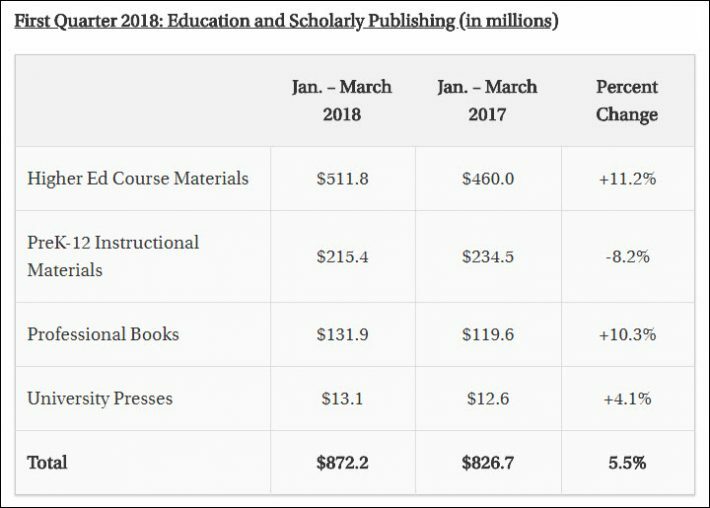 “Publishers saw revenue gains in adult books, professional books, and university presses, continuing trends from 2017. “Adult books saw double-digit growth in January (up 13 percent) and February (up 12.4 percent). “While ebook revenue decreased for the quarter, March saw 1.5-percent growth for the format. The US market is always under particular scrutiny during the late-spring week of BookExpo, of course, and this year many publishers will be watching to see if the trade show’s new “reimagined” concentration on the cultivation of booksellers has a demonstrably beneficial effect. 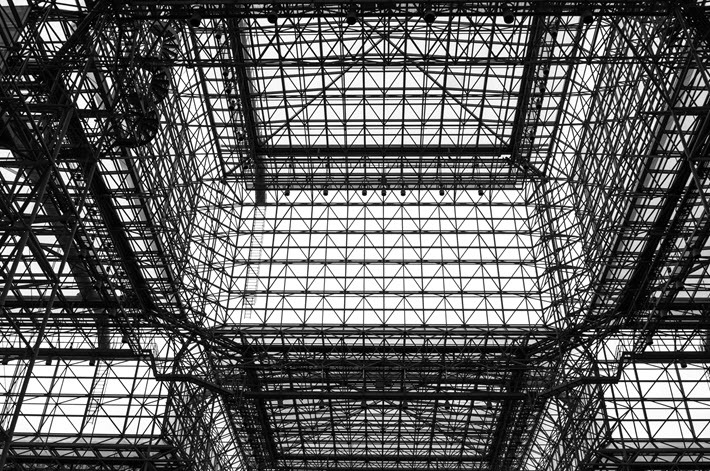 With foreign rights trading essentially removed from BookExpo by the competitive New York Rights Fair—as Publishing Perspectives has covered here—the Jacob Javits Center is an even more Ameri-centric hub of activity than in the past. BookExpo has named the New York Rights Fair its official rights center, a development that many hope will mean the rights event can be held at the Javits next year with BookExpo, instead of two miles away at the Metropolitan Pavilion. Nevertheless, as long as much of the trade show’s emphasis revolves around the publisher-bookseller relationship, the publishers association’s upbeat announcement about the US industry’s Q1 performance will of course be welcome. Several charts from the first-quarter report are of interest. 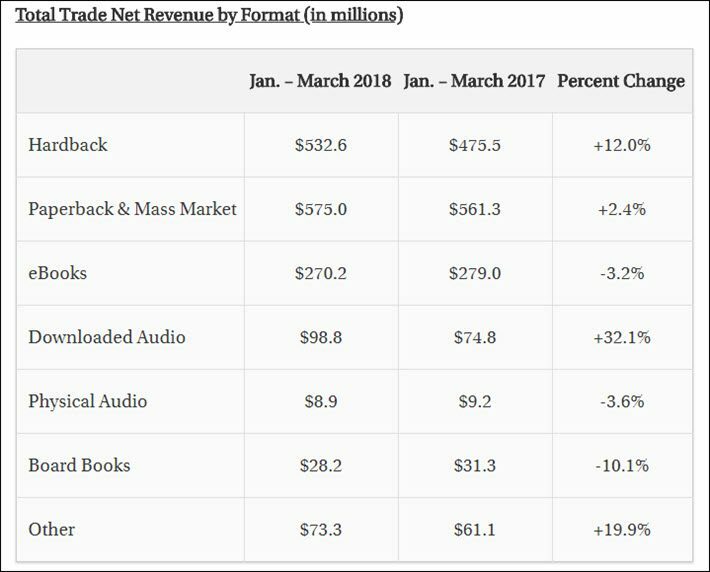 For example, the downloaded audiobook sector—a darling of the industry thanks to years of strong growth—continued to outperform other formats, up a remarkable 32.1 percent in the first quarter of this year over the same period last year. And physical audio was down 3.6 percent over the same period last year. The story of audiobooks’ robust health lies, after all, in the development of digital delivery—witness those “binge better” commercials that Amazon’s Audible is airing. Ebooks, down 3.2 percent for the quarter, were up, in the adult divisions, in the month of March, by 1.5 percent. Print “generally continued growth from 2017,” the association reports. “Revenue from print books totaled $1.14 billion, up about $67.7 million (6.3 percent), from the first quarter of 2017. The increase is attributed to growth in trade’s two largest formats, hardback books (up 12.0 percent) and paperback books (up 3.2 percent). As Publishing Perspectives has reported here and here, the Association of American Publishers is sponsoring three key panel sessions during BookExpo this week, a “leadership roundtable” with Big Five CEOs, a session focused on copyright policy and publishing, and one on publishing and the film industry.